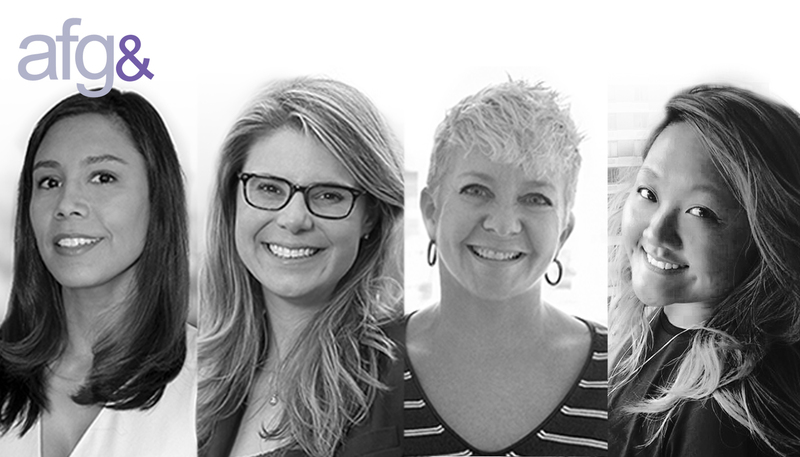 We spoke to some of our female leadership team here at AFG& – Executive Group Managing Directors, Dawn Terrazas and Amy Adams, Managing Group Director, Tara DeCoursey, and Group Account Director, Elisa Tsang, to get their perspective on what it means to be a woman in a position of power today in a traditionally male-dominated field. “I think we need to look at the areas of our industry that still feel male-dominated and focus on leveling the playing field”, DeCoursey tells us. “I’d like to see more women on the creative side of advertising, as well as on the production side – photographers, directors, etc. In my nearly thirty year career, I’ve worked with two female directors; and one female photographer, that’s it”, she laments. Adams agrees, “…as someone in a leadership role, I believe that women bring a unique perspective to this business. I hope that the next generation of women are given the opportunities they need to be elevated and lead organizations – to rise to the level of authority they deserve”. And Adams is certainly not the only one who wants to see more change. “There’s always opportunity to truly close the gap AND build diversity. It’s not just gender. As a minority female, I’ve yet to see a real evolution” Tsang states. And this kind of support is what the fourth wave of feminism is all about. Terrazas recalls the refrain of the times – “Stay Woke. It’s great to believe in it and spread it – that’s why I am a Co-Chair for the Women’s League Network”. And it’s clear that Terrazas, Adams, DeCoursey, and Tsang are making that change. Paving the way for females in the industry the way their mentors did for them. And those female-positive people, aren’t always women themselves. It takes both sexes to make this equality thing happen. “How lucky I have been to work for a man like Frank Ginsberg – who has put all his trust and faith in women to lead his agency across the world”, Adams muses.